Special thanks to Conrad Bali for hosting. Just after a beautiful Balinese sunrise, we're transported away from the sandy coast of Nusa Dua to Carang Sari, where hilly, lush tropical forest is spread and wild animals roam. We're here to visit a chocolate factory, my hosts from Conrad tell us. I'm not particularly thrilled given the early hour after a night of wedding guest festivities (another post on that later) and my general indifference towards chocolate. Upon arrival, the other journalists and I tumble out of the vehicle, still drowsy after the one hour journey. We snap out of lethargy soon after when a team of elephants casually stroll past us. The chocolate factory owner, Toby Garritt, explains his wife oversees a guided elephant trek around the surrounding area. 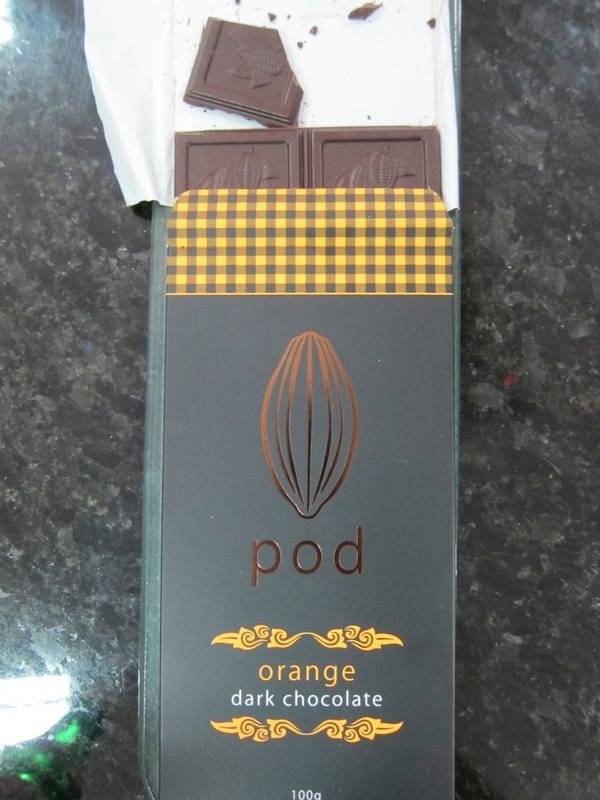 In fact, these elephant tours are what led to the founding of POD Chocolate Factory. Along his elephant trek three years ago, he discovered cocoa trees grew naturally in the area, but weren't being harvested for socioeconomic reasons. Toby developed a system to make the harvesting process more efficient and sought to teach farmers how to produce high-quality coca beans. 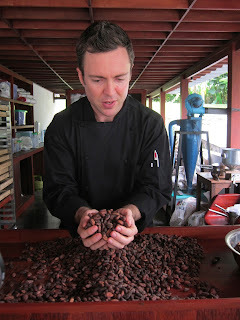 The farms now yield double the produce and the local farmers earn much more per batch, and Toby now has beans to create Bali-original chocolates. 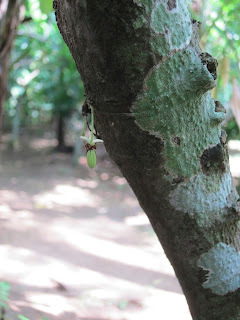 This cocoa flower has made it to stage two. The cocoa flowers that manage to make it to stage two begin its growth into a pod. Using clever natural methods to deter pests, many of the pods make it to full ripeness. 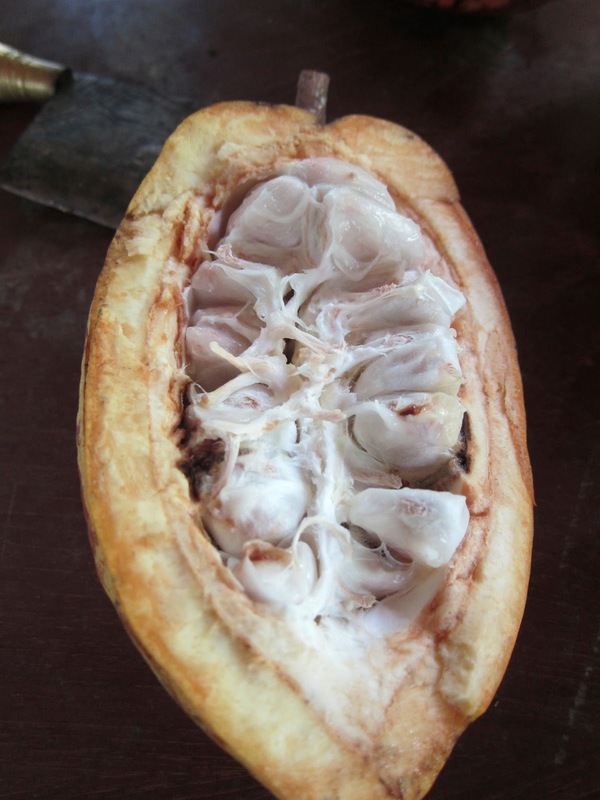 Not unlike opening a coconut, the local farmer breaks the pod open with a machete to display its innards--layers of seeds bedded in muculent coating. The texture reminds me of soursop fruit. 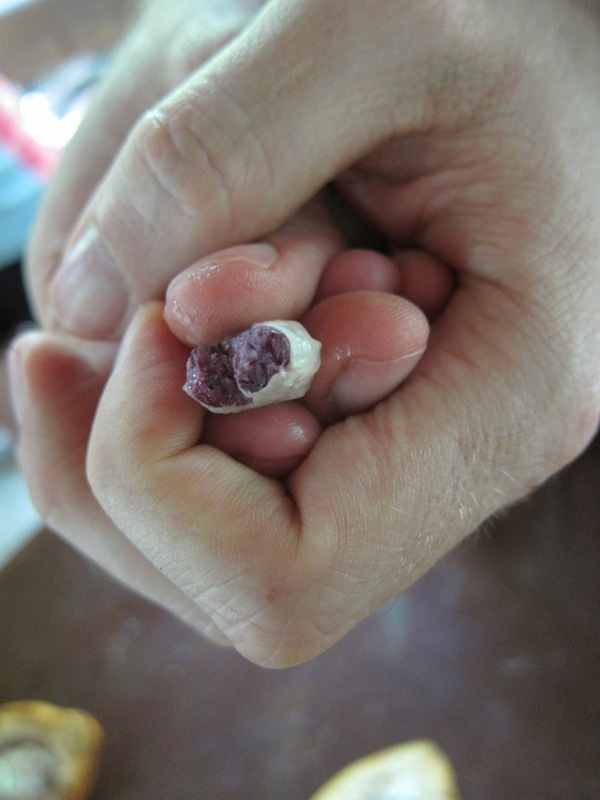 The seeds are edible, Toby says, so what is a food writer to do other than taste it? Around the farm, bottles filled with natural substances lures and traps male pests, so they can't reproduce. No two cocoa pods are the same. Edible, but the flavors lack any resemblance to chocolate as we know it. It turns out, the raw seed bears zero flavors that resemble chocolate. I actually find the seeds quite palatable, with a likeness to mangosteen notes. 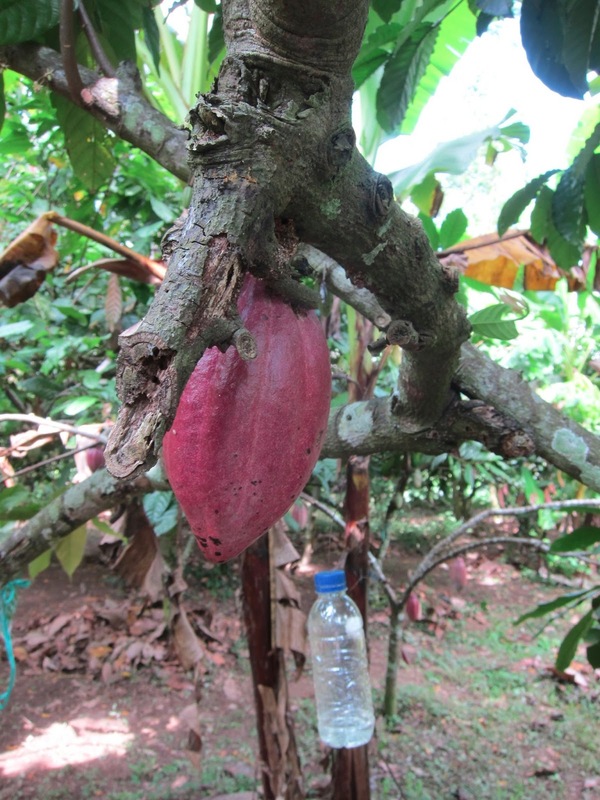 I would have been content to end my trek here with the colorful pods and sweet cocoa seeds, but alas the journey continues! The raw seeds are then fermented naturally in the shade of wooden crates, covered by banana leaves. I was apprehensive when Toby asked us to take a whiff into the box. Fermented anything isn't known to be too kind on the senses, but with similar scents to plum wine, it seems cocoa seeds are an exception. 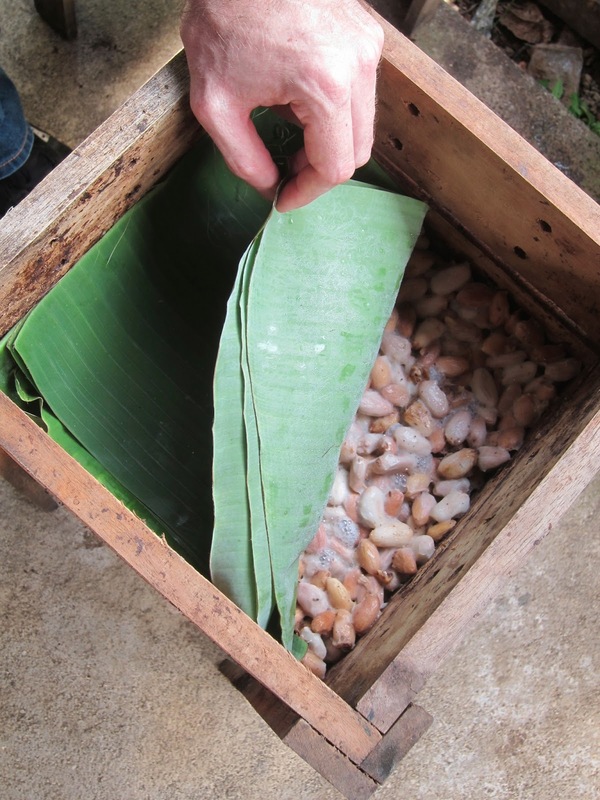 After the fermentation process, the seeds are laid out to dry under the equatorial sun. Though edible, Toby doesn't recommend tasting them during this stage. Once dry, the seeds are now beans and are transported to the POD Chocolate Factory, where most might say the real fun begins. How High Quality Chocolate is Actually Produced. The beans are then roasted, a process much like coffee bean roasting. This is the stage where the cocoa flavors everyone knows and loves finally emerges. At this point, we're encouraged to crack the beans open and try the chocolate nibs (yep, don't mind if I do). When coffee beans are grounded, they become dry grinds. 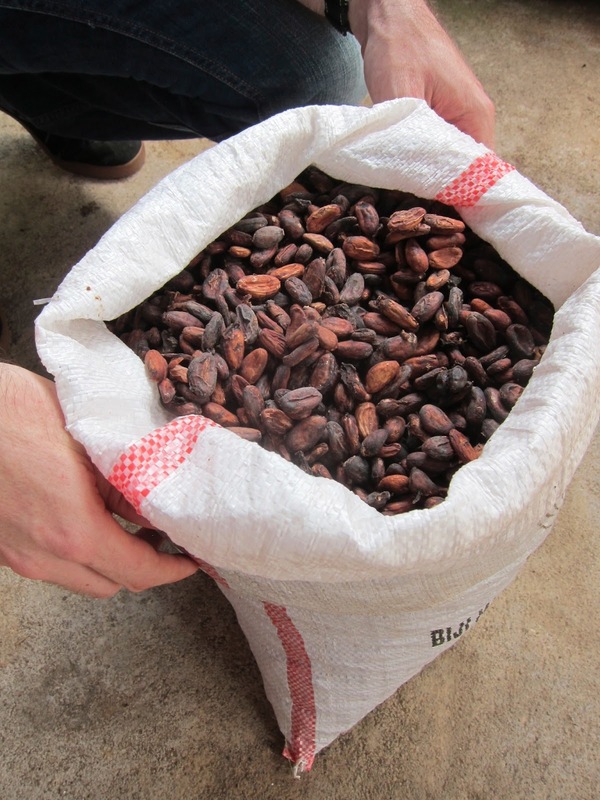 Cocoa beans, however, have much higher fat content. When ground up, the cocoa nibs become paste. The paste is then put through a finer grinder, followed by the melanger. At this point, a good chocolatier wants an experienced pastry chef to step in. 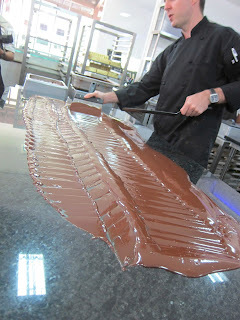 The chocolate is poured over a marble surface, then tempered. The movement, speed, and temperature is crucial in this process, as the crystal structure is being molded into a chocolate's most ideal state. Conrad's Pastry Chef Semawan demonstrates part of the tempering process. Tempering chocolate is crucial to producing high quality chocolate. You might find that mass market chocolate crumbles rather than snaps, and when left out for long periods, the chocolate will 'bloom'--unpleasant white patches that form over its surface. After this point, chocolate can be poured into molds for simply chocolate, or chefs like Conrad's Pastry Chef Semawan can craft cocoa-magic for dessert (more on these desserts later). By the time we reached lunch hour, I had tasted each of POD Chocolate's various chocolate bars (white chocolate, milk chocolate, dark chocolate, darker chocolate, peppermint chocolate, orange chocolate) and still wanted more. I ended up purchasing a couple more bars to take home and share the chocolate love with friends in Singapore. So much for being indifferent to chocolate. 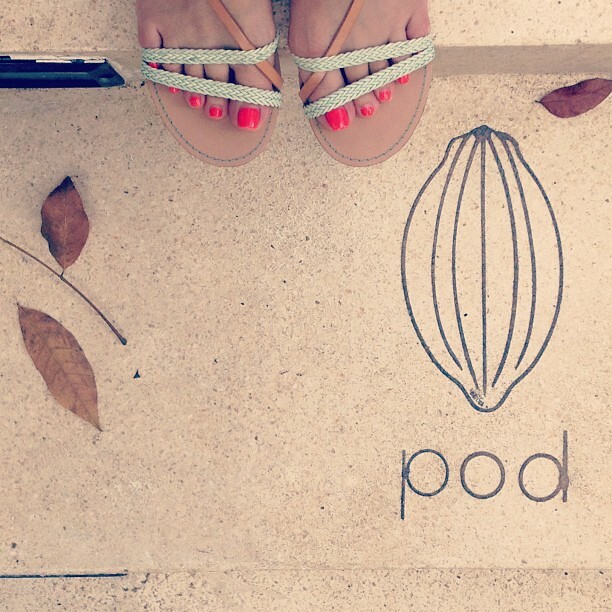 Follow POD Chocolate Factory & Cafe on Facebook or visit www.pod-chocolate.com for more information. 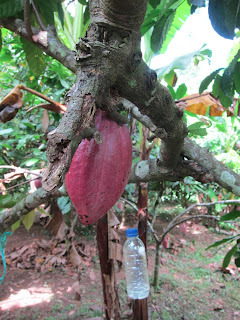 Chocolate tours, elephant treks, spa retreats, and white water rafting is available. Oh, and did I mention that they house two honey bears and various species of local wildlife for rehabilitation? You can see these animals in their open air enclosures while you have a bite to eat at POD's cafe. Honey Bear is camera shy. Really nice and interesting post ! I'll try these chocolates !